The Oxford Lab Products graduated centrifuge tube is available in 3 volumes: 0.5 mL, 1.5 mL, and 2.0 mL. The centrifuge tube is manufactured from virgin polypropylene (PP) in a high-quality mold. 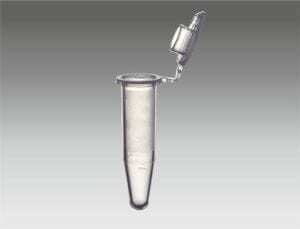 The Oxford Lab Products centrifuge tube is certified sterile, DNase-, RNase-, Human DNA, Endotoxin & Pyrogen free. The Oxford Lab Products sterile tube can withstand centrifugation forces of up to 20,000 x g.
The main features of the Oxford Lab Products sterile centrifuge tube are one-handed opening and closing of the tube, perfect sealing and evaporation protection as well as a polished interior to prevent protein adhesion to the tube. 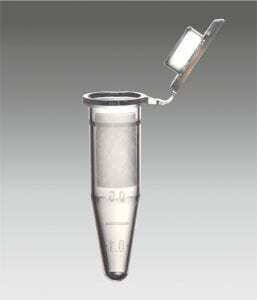 The Oxford Lab Products sterile tube also offers high clarity for optimal sample visibility. The tube is compatible with all centrifuge units. The tube is manufactured from FDA approved resin and free from heavy metals and additives. It is manufactured in a fully automatic, human touch-free plant with class 100K clean room facility. The tube can withstand temperatures from – 80 to +121 degrees Celcius making it suitable to a variety of storage and experiment applications. It fits all standard and high capacity centrifuge rotors and the tube is supplied in double safety self-standing bulk bags & eco-friendly racks. Looking for a centrifuge? Check out the BenchMate C12V High Speed Microcentrifuge or, for something smaller, the BenchMate C8 Microcentrifuge. Manufactured from FDA approved resin. Certified RNase, DNase, Human DNA, Endotoxin & Pyrogen free. Free from heavy metals and additives. Manufactured in a fully automatic, human touch-free plant with class 100K clean room facility. Can be centrifuged at up to 20,000 x g.
Able to withstand temperatures from – 80 to +121 degrees Celcius. Fit all standard and high capacity centrifuge rotors. Supplied in double safety self-standing bulk bags & eco-friendly racks.